In 2015, RANSW reviewed and updated our Reconciliation Action Plan. Through a community consultation process our research staff connected with Susan Moylan-Coombs, Director of The Gaimaragal Group and started a conversation about how to better deliver services to the First Nations community of the Northern Sydney region. What came next was a conversation about different styles of healing and conversation therapy, different cultural practices and different healing settings, and Caber-ra nanga was created with the intention of opening up a space that was outdoors in nature to provide better support and links to services for First Nations community, individuals and families. The first Caber-ra nanga event was held at Stony Range with the support of RANSW Northern Beaches staff at Dee Why. Today Caber-ra nanga Engage is a program that has been funded by the Sydney North Primary Health Network in Northern Sydney to provide co-created services, collaboratively between RANSW & The Gaimaragal Group. The gatherings were gifted a Gaimaragal word by Professor Dennis Foley, Gaimaragal language speaker. Caber-ra-nanga means 'Resting the Mind'. Providing targeted mental health professional training e.g. Aboriginal Mental Health First Aid. 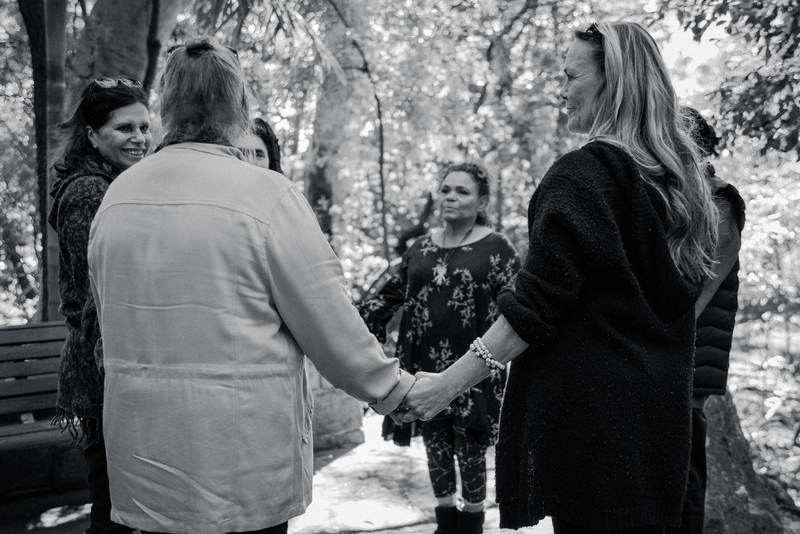 Caber-ra-nanga ENGAGE is an innovative partnership based on RANSW Commitment to bridging the reconciliation divide and building meaningful, responsive and culturally safe partnerships built on respect and opening doors and creating new pathways and opportunities is what we at RANSW strive to do (Stretch Reconciliation Action Plan 2015-2018). To find out more about the Caber-ra Nanga Engage program, watch the beautiful films below – 5-minute version and 60-second version. Caroline Glass-Pattison is a proud Wiradjuri, Dungutti woman from Central West NSW. An advocate of rights & social justice for Australian’s First Peoples, Caroline has followed in her Grandmother Polly Moylan-Smith’s footsteps. With an extensive professional career, Caroline has experience working within Indigenous Affairs both government and non-government systems. With 20 years’ experience working in the Community Services sector, with both Local Government and Not For Profit areas in community development. Her greatest hope is for the future as a collective of Australia’s First Peoples, living on the same continent, to recognise the unique environments and differences of all peoples and cultures as a great source of pride for all of us. To hear language of ‘disadvantage’ and ‘gaps’ disappear to be replaced with resilience, survival, excellence and innovation. “We should acknowledge our past in full, and embrace our future”. Through Caber-ra-Nanga, individuals and groups are better able to listen to themselves, to each other, to ancestors, and to the earth, and in doing so, find their own answers to their challenges, and to those of their family and community. For more information or any general enquiries about the Caber-ra Nanga Engage program please email engage@ransw.org.au or call Caroline on 0422 085 589.